LIL' WITCHES & WARLOCKS NIGHTCARE. This collectible porcelain building can be used to add some Halloween Spirit(s) to your S or O "scale" toy train layout not perfectly scaled to either, but why not relax your standards and have some Halloween fun with a spooky railroad? Intended for use with 120 volt AC household electric current as used in the United States. Users in other countries may require a voltage converter if your household current is 220 volts. Witch sign rotates on rooftop. Witches revolve in and out of the building chasing each other. Size (H x W x D). 11.22 x 10.63 x 9.06 inches. 28.5 x 27 x 23 cm. Volume Control and Power Switch for all functions. 320mA current at 4.5V DC. SPECIAL TERMS FOR THIS FRAGILE COLLECTIBLE ITEM: LIMITED RETURN PRIVILEGE. These parts typically detach at the glue joint, with little or no actual damage to the part itself. We cannot guarantee that this will not happen, and it will not be considered as a defect or "item not as described". Return requests based upon the type of easily repaired detachment described above will NOT be authorized. WHY DO WE HAVE SPECIAL TERMS FOR LEMAX COLLECTIBLES? We have adopted these policies in order to help ensure that we will be able to continue offering Lemax collectibles for many years to come. Storage and finance costs are quite significant. Since we are not allowed to place reorders once the ordering deadline has passed, we must necessarily protect the value of our expenditure by minimizing unnecessary losses. This explanation is being provided in the hopes that the insight it provides will help to gain your understanding, acceptance and cooperation with our Terms and Conditions. Photo is of a representative sample. Actual item or packaging may vary. We have many similar items available, so please visit. Trains and Toys for Big Boys. Often, and view the category: Seasonal - Halloween. Many items are available in multiple quantities (fixed price listings), so please view the Quantity Available , which is shown near the top of each applicable listing, and order as many as you need! We have many more great items available! NO OTHER INTERNATIONAL BUYERS at this time. DO NOT CHOOSE PARCEL SELECT! Because it will cost less! For more helpful information, please read the terms and conditions below. Verdant Vernacular translation by Red-Nek Roy: We may pak yur stuf with yoozed boxes an' pakin' muteeriuls lyk resykuld noozpapurs in ordur t' he'p the envyurnmint. We Strive to Make Each Customer a Repeat Customer! Terms and conditions tend to evolve over time, as new situations and solutions arise. The Terms and Conditions included in the My World page shall always be considered as the most current, and shall supersede and/or be considered as an addendum to the terms and conditions within the listing. In some cases, other arrangements can or will be made. Certain items may be excluded from the above-mentioned list of countries and regions. Most of our items are of limited quantity, and we would prefer to deal with people who appreciate the amount of time, effort and expense that is involved in the CAREFUL PACKAGING of our premium items. Please make only factual, verifiable statements in your feedback. Avoid this possibility by refraining from emotional, unverifiable and/or untruthful statements, name-calling or other maliciousness. 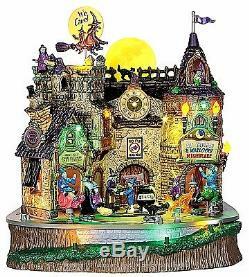 The item "Lemax 45670 LIL' WITCHES & WARLOCKS NIGHTCARE Spooky Town Building Animated I" is in sale since Tuesday, October 11, 2016. This item is in the category "Collectibles\Holiday & Seasonal\Halloween\Current (1991-Now)\Decorations\Other Current Halloween Décor". The seller is "trainsnbrains" and is located in Charlotte, North Carolina. This item can be shipped to North, South, or Latin America, to all countries in Europe, to Australia.